The new benches in the quadrangle have been completed and they look fabulous! Even more exciting is that fact that it is made from Ekodeck Plus, a timber substitute which is a composite of reclaimed timber and bamboo and High Density Polyethylene (HDPE). You may also be interested to learn that in addition to decking made up of Ekodeck Plus, the natural timber trim is reclaimed timber from the spectator seats of the indoor pool at the AIS, which was completed stripped out. A great example of re-purposing. Congratulations to our Year 10 students who celebrated their academic achievements and the end of Year 10 on Thursday 6 December at a special ceremony. 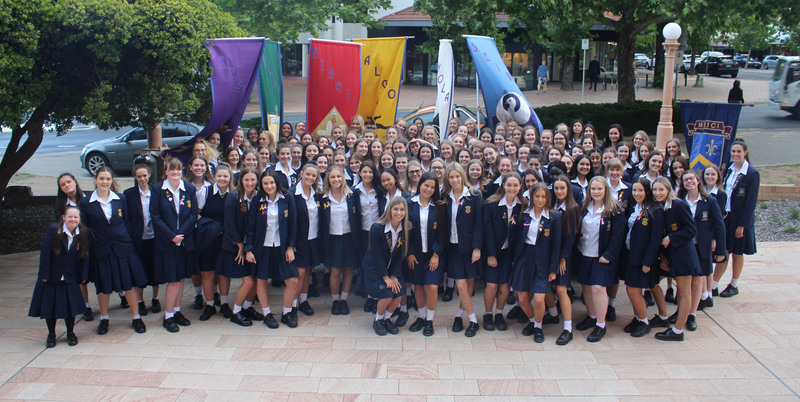 As our Year 10 students prepare to embark on their next stage of their educational journey, the College would like to thank them, recognising their sucesses, both academically and more broadly, their contributions to many aspects of the life and community of Merici College. Congratulations to our Year 10 students who celebrated their academic achievements and the end of Year 10 on Thursday 6 December at a special ceremony. Congratulations to our Year 12 students on their graduation and academic achievements. We would like to thank the students for their valuable contribution to the life of Merici College and we pray that God richly blesses them as you continue your journey through life. Every year you have heard the words of our mission statement: Merici College challenges you to love life, have hope, be faithful and to build futures more wondrous than you dare to dream.